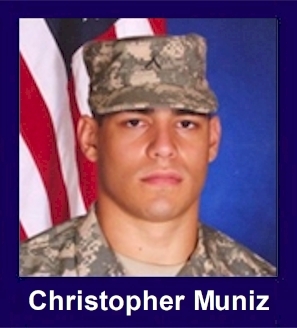 The 35th Infantry Regiment Association salutes our fallen brother, SGT Christopher L. Muniz, who died in the service of his country on December 11th, 2011 in Afghanistan. The cause of death was listed as IED. At the time of his death Christopher was 24 years of age. He was from New Cuyama, California. Sgt. Muniz was attached to A,2/35th from the 3rd Brigade Special Troops Battalion, 3rd Brigade Combat Team, 25th Infantry Division. Sgt. Muniz's additional awards and decorations include the Army Commendation Medal, Army Achievement Medal, Army Good Conduct Medal, Afghanistan Campaign Medal with Bronze Service Star, Global War on Terrorism Medal and the Army Service Ribbon. Posthumous Awards include the NATO Medal and the Combat Action Badge. On the afternoon of 11 December 2011, 2nd Platoon from Alpha Company "Apache" was conducting a patrol in the Shaunkrai Valley in the South Kunar River Valley when one of their vehicles hit an IED. SPC Ronald Wildrick from Apache Company, 2-35 IN BN and SGT Christopher Muniz from Bravo Co, 3 BSTB who was attached to Alpha Company, and Mr. Merza Turan, an American-citizen serving as a Category II Linguist were killed in action. Army Sgt. Chris Muniz, a graduate of Cuyama Valley High School, was killed in action Sunday in Afghanistan. ...The small, tight-knit community of Cuyama Valley is mourning the loss of a 24-year-old soldier who died Sunday after a bomb exploded in Afghanistan. Sgt. Christopher L. Muniz of New Cuyama was one of two Hawaii-based soldiers killed in the Kunar province when enemy forces attacked their unit with an improvised explosive device. Muniz and Spc. Ronald H. Wildrick Jr. of Blairstown, N.J., were assigned to the 3rd Brigade Combat Team of the 25th Infantry Division at Schofield Barracks, Hawaii. Munizs death led to a "pretty sad mood" all over the small town, especially Cuyama Valley High School, where the soldier played on the football team before graduating in 2006. "I knew him very well. He was like a second son to me," said football coach Biff Charlton. "I dont know how you could say anything as good as he actually was." Muniz played linebacker and full back for the Cuyama Valley Bears. The coach recalled the player, one of the strongest ones he had, often would help other youths in the gym and make them believe they were equally strong. "He was just an all-around wonderful kid. He was a true leader," Charlton added. Charlton said his wife received a call from the soldiers mother with the three dreaded words - "Chris is gone." As word of Cuyamas war casualty spread, former players contacted Charlton, one stopping by Monday night when the coach and former player shared their mutual grief by "both holding each other, just sobbing," Charlton said. The sergeant is believed to be the first casualty from Iraq or Afghanistan for Cuyama Valley High School. He went from the schools eight-man football program to become a starter for Hancock Colleges team "which is pretty amazing," added Charlton. Muniz played for the Bulldogs during the 2006 and 2007 seasons, while attending the community college as a liberal arts major, Hancock officials said. Bulldogs coach Kris Dutra recalled Muniz as a being "a very very physical type of guy. Hes a good solid linebacker. "He was a soldier in every sense of the word," Dutra said, calling his former player "loyal, hardworking and a good athlete." Muniz, the son of Cuyama Valley residents Joseph Muniz and Barbara Kalp, died about a week before his scheduled return home for a break from being in the Afghanistan, according to Charlton. About 18 months ago, the soldier married a woman he met while serving in the Army. Their wedding was in Hawaii, but she reportedly is from Texas. Army officials said that this was Munizs first overseas deployment, adding that he had enlisted in the Army on Nov. 13, 2008, as a signal intelligence analyst. He belonged to the 3rd Brigade Special Troops Battalion at Schofield Barracks, Hawaii. The soldier will posthumously be awarded a Bronze Star Medal, Purple Heart, NATO Medal and the Combat Action Badge, Army officials said. His other awards and decorations include the Army Commendation Medal, Army Achievement Medal, Army Good Conduct Medal, Afghanistan Campaign Medal with Bronze Service Star, Global War on Terrorism Medal and the Army Service Ribbon. Funeral details werent immediately available, but Cuyama Valley High School officials reportedly plan to hold a memorial in January. Muniz adds to the roster local residents killed while serving in Afghanistan and Iraq since 2003, with more than a dozen dying in the two wars.